Warning: the reading of the following post may cause excessive salivation. Prepare to dribble. Might be an idea to grab a cuppa, too, cos it’s longish… But you know what I’m like when we talk food, right? 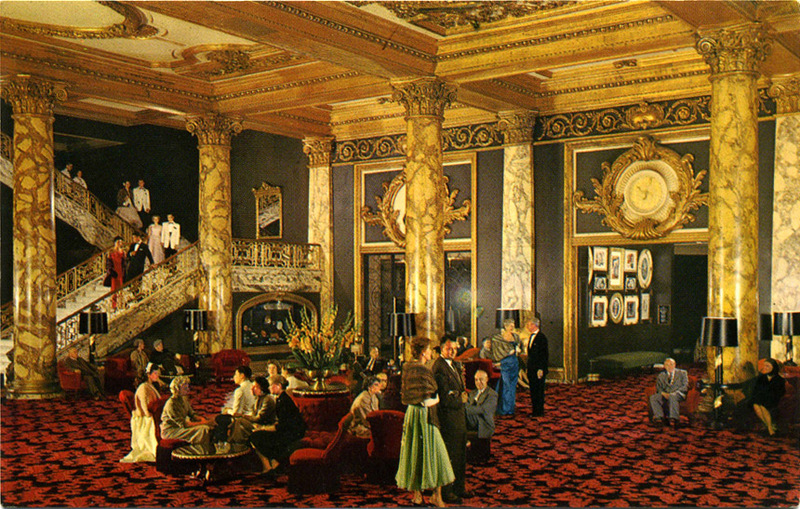 The lobby at The Fairmont. At long last Monsieur and I could begin our much-needed honeymoon in earnest. In the course of a few short days we’d said our I Dos, celebrated in style, travelled across the globe in spite of that inconsiderate Icelandic volcano and were now safely in San Francisco. At the airport they’d run out of moderate-sized cars so upgraded us to a mammoth of a bright white SUV that had so much interior space that Monsieur and I felt like a pair of Smurfs driving along the freeway. Ah yes, we had definitely arrived in The Land of Super-Size Everything. Following a sleep so deep that we could have been mistaken for a pair of new stone effigies in neighbouring Grace Cathedral, we were now in dire need of breakfast, so followed our noses down to the lobby in search of much black coffee and eggs with everything. It would be quite factual to say that we were quite empty and desperate to refuel. Barely skimming the menu in our starved state, Monsieur and I decided to go for the Deluxe Hot Buffet which, quite frankly, was a bargain for $28.00 (at least, it was the way we did it). We enjoyed bottomless freshly-squeezed orange juice, ice water and coffee, and tucked right into the buffet. Our word of that particular morning was “more!” and with good reason because we hadn’t eaten properly for almost a day. That’s right, people, a full 24 hours without food and we didn’t do it for charity. FYI: I do not classify the plastic wrapped oozy object that the airline called ‘a light meal’ as food. 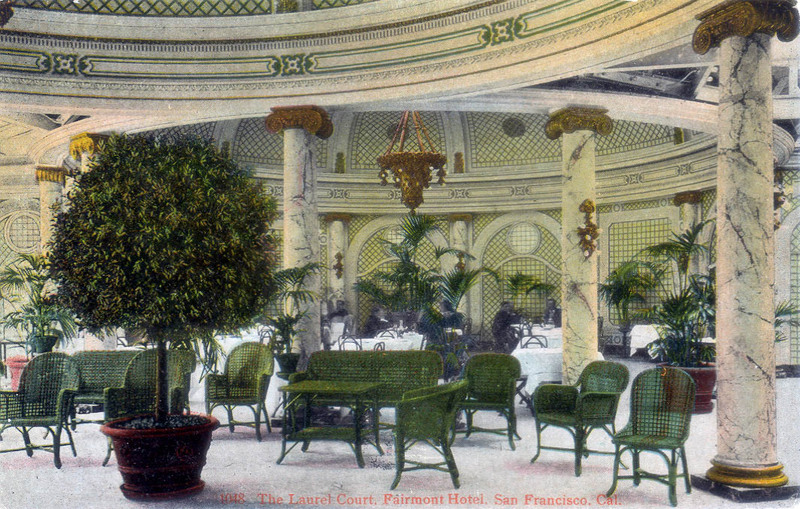 Laurel Court at The Fairmont. On the bakery island we found pastries so soft and fragrant that they must have just been lifted out of The Fairmont’s own ovens. The varieties of bread catered for all palates, including the densest, darkest pumpernickel and multiple multi-grained breads alongside classic rye, sourdough, sweet brioches and slices of downright ordinary white. There were baskets of bagels, piles of fat scones from both sweet and savoury recipes, granola and porridge for cereal-lovers, a selection of cheeses from nearby Sonoma and a veritable charcuterie of cured meats. The low-fat raspberry yoghurt was the fullest tasting low-fat variety I’ve ever had the joy to slurp and the platter of fresh fruit sat so heavy with sliced melons, bulbous berries, Californian oranges and squeaky shiny apples that it reminded me somehow of The Garden of Eden. Beneath stainless steel covers in the hot foods buffet we found bacon and sausages and morning-fried potatoes. Then a smile spread across my husband’s face: he’d found the eggs Benedict. 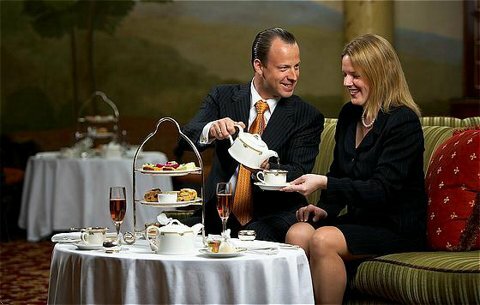 Anyway, in our time at The Fairmont, Monsieur and I enjoyed two Laurel Court breakfasts and were intensely gratified by both. On one occasion I joined Monsieur in trying the eggs Benedict, to find that he was indeed correct in his appraisal that they were very good (but I also prefer mine). On the other occasion, I asked the egg chef to make me an omelette with tomatoes, scallions, wild mushrooms and mozzarella. Once again, it was very good, but The Epicurean Brother makes them better. I gave Monsieur my omelette appraisal, to which he replied: “what is it about your family that you’re all so good at making eggs?” To that, I have absolutely no answer, apart from: “just wait until you try my brother’s TORTILLA!” I guess we just enjoy the fruits of happy hens. 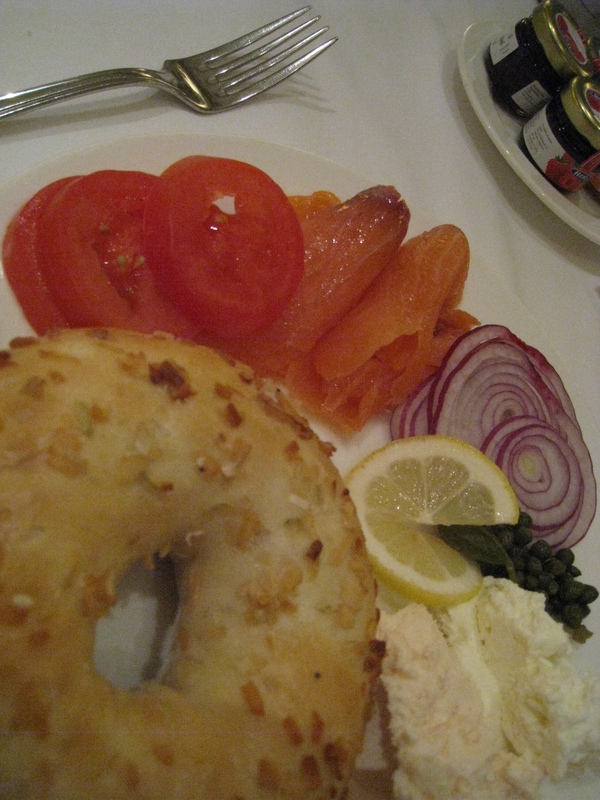 Apart from trying the eggs at The Laurel Court, I also enjoyed constructing my own bagel one morning. Lightly toasting an onion bagel I spread it with a blend of smoked salmon and regular cream cheese then layered it with soft folds of Atlantic smoked salmon and slices of a perfect tomato. With a squeeze of fresh lemon, a few crisp rings of red onion and a sprinkling of miniature capers I was good to go. And that, my foodie friends, is one bagel I won’t soon forget. It has something to do with the tomato that tasted exactly as a tomato should – tart with juice, unlike the bland red fruit we too often find served up at home which, to my mind, are tomatoes in name only. The salmon was also a revelation compared to the over-farmed slices to be found on London’s supermarket shelves. It practically dissolved on the tongue with the full flavour of a fish that had enjoyed a life free of pent-up farm pond misery. The key to the success of this bagel was all down to the ingredients. My perfect bagel with the Happy Salmon. Returning to the breakfast menu for a moment, I must share a few of the a la carte options. There’s Fig-Stuffed French Toast, comprising local black mission figs, brioche, organic eggs, cream and maple syrup. It’s served with roasted red and gold new potatoes and a traditional breakfast sausage. For the health-conscious there are Flaxseed Pancakes, made with dried cranberries and blueberry syrup. These are presented with sides of Asian pears that have been poached in syrup, Riesling and vanilla, and a chicken apple sausage. The classic poached eggs come with Yukon gold potato latke and corned beef hash and even the oatmeal turns up at table with roast potatoes and Applewood smoked bacon. Having said that, these combinations are mere suggestions. On ordering you can select whichever sides you like to accompany the main plate. The Laurel Court calls this ‘couture cuisine’ and positively encourages their patrons to play havoc with their menu. And no, in case you’re wondering, Monsieur and I were not born with bottomless stomachs so we did not try any of the above, not that we weren’t tempted. The buffet provided plenty of everything for both our appetites and believe it or not, we’re not that gluttonous. Yet. Had Monsieur and I been intent on growing our girths at the Fairmont we could feasibly have noshed there all day. In addition to breakfast, The Laurel Court provides light lunches of classic dishes like grilled ham and cheese sandwiches, flatiron steaks and insalata Caprese. Then there are dishes with a twist, like the Bloody Caesar Salad which uses both red and green romaine lettuce, or the simple sliders made with top-notch Kobe beef. Some guests prefer to enjoy this elegant dining room over a sedate afternoon tea including six sandwich varieties, two of those previously-mentioned fat scones and five desserts. You can even add on bubbly and caviar or chocolate truffles. (Goshdarnit. I’m making myself hungry.) If you have a taste for some end-of day relaxation with a glass of something stronger in hand, then The Laurel Court has a pianist to tinkle you into reverie with soothing classical music. Get a load of this cheesy geezer! That grin is oh-so-very wrong. Sadly, Monsieur and I didn’t have enough time to try The Laurel Court’s offerings apart from their superb breakfasts for we were only stopping over in San Francisco but we were impressed with our experience there. As we left on the next leg of our honeymoon, Monsieur remarked “that was one of the best breakfasts of my life.” Now, that’s a true compliment coming from a genuinely fussy customer.